Peer Reviewer: Prof. Nadim Farajalla. Lebanon is naturally water rich compared to other countries in the Middle East and North Africa (MENA) region. However, much of this water flows to the sea unused due to inefficient use and poorly maintained or absent infrastructure. As a result, water shortages are increasingly common. The influx of more than one million Syrian refugees since 2011 and the impact of climate change are likely to worsen problems of scarcity in the future. Water shortages and cuts are already common in summer, and residents have little choice but to use unlicensed wells and private water providers, which in turn threatens the sustainability of the water supply. Water pollution is also a serious problem, as only around 10% of the country’s wastewater is treated and the remainder is released directly into the environment or the sea. Over the years, various projects have sought to develop and improve water infrastructure, but political and financial problems have prevented their successful implementation. In addition, the Lebanese water sector is highly bureaucratic and fragmented, with a large number of bodies with overlapping mandates. Moreover, the fact that there are few administrative decrees to comply with existing legislation and the law is not enforced means that sub-national performance is poor. Located on the eastern coast of the Mediterranean Sea, Lebanon covers a total surface area of 10,452 km2, with a coastline of about 220 km from north to south. It is bordered by Syria to the north and east and Israel to the south. Geographically, Lebanon is made up of a narrow coastal strip that runs parallel to the Mediterranean Sea and two mountain chains, the Mount Lebanon and the Anti-Lebanon, running north to south. The fertile Bekaa Valley lies in between (Fig. 1). Lebanon has a typically Mediterranean climate with cool, rainy winters from December to mid-March and hot dry summers from June to September. Average temperatures vary across the country from 20°C on the coast to 16°C in the Bekaa Valley and less than 10°C in the mountains. Annual rain- and snowfall levels vary from a low of 200 mm in the northern Bekaa Plain to 600-900 mm along the coast and more than 1,500 mm on the peaks of Mount Lebanon. Lebanon has an annual average precipitation of 800 mm. Precipitation mainly occurs between the months of October and April. Figure 1. 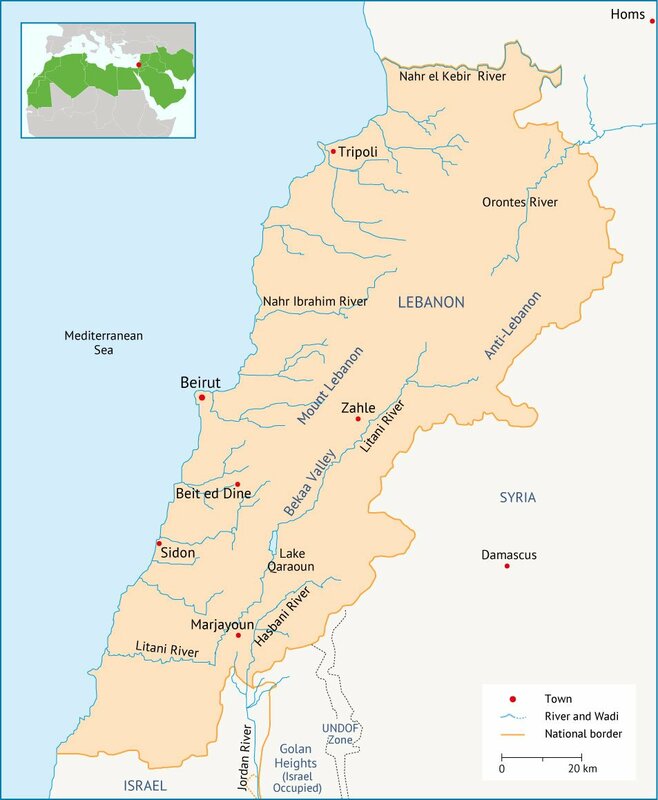 Map of Lebanon with major rivers. Source: Fanack after University of Texas. Lebanon had an estimated population of 4.5 million people in 2013 as well as a refugee population of more than 1.5 million. In addition to its Lebanese residents, the country has nearly 450,000 registered Palestinian refugees who have been living in camps since 1948. More recently, Lebanon has absorbed around 1.2 million Syrian refugees, which has put great pressure on the economy and the provision of basic services. The country is highly urbanized with more than 85% of the population living in cities and a third of the population concentrated in the Greater Beirut area. The Lebanese economy is based mainly on the services sector, which accounts for around 73% of GDP. Agriculture constitutes around 7.2% of GDP and the industrial sector makes up for the remaining 19.8%. GDP per capita was estimated at $9,928 in 2013. The Lebanese economy has been severely affected by the growing regional turmoil since 2011: GDP growth levels have declined substantially, from 7.5-9.3% for the period 2008-2010 to 1.5% for the four subsequent years. In its latest global economic monitor, the Institute of International Finance (IIF) forecasts Lebanon’s real GDP growth at 2.8% in 2015 and 5.0% in 2016. 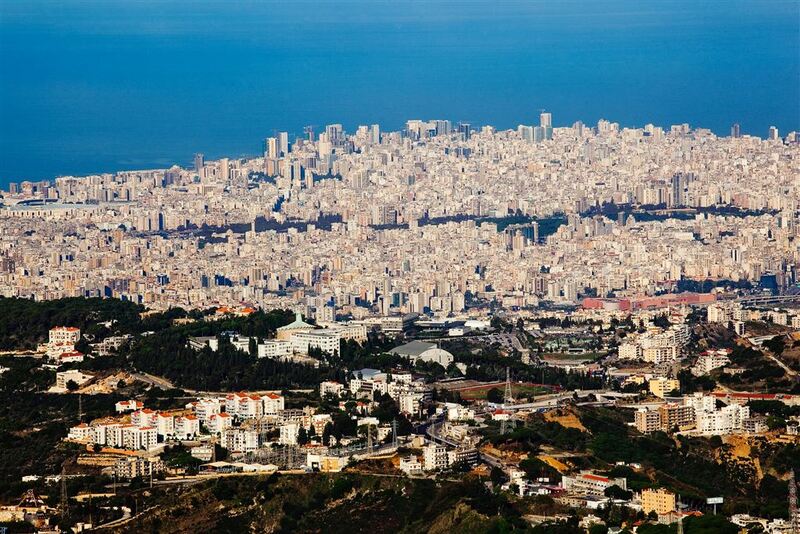 View of the Lebanese capital Beirut. Photo: VAO/V. Undritz. FAO, 2009; Comair, F., 2009. Water Management and Hydrodiplomacy in Lebanon. Notre Dame University Press, Zouk Mikayel. Ministry of the Environment, 2011. Latest estimates according to World Bank, 2015. Lebanon’s last official population data was published in 1997 (Central Administration for Statistics) and in 2004 (Ministry of Social Affairs). These figures were, however, based on projections. The last official census was conducted in 1932. Figures from UNRWA, July 2014. UNHCR 2015; Van-Vliet, S. and Hourani, G., 2014. Estimates for the year 2013, World Bank, 2015 and Ministry of Finance, 2013.